To build the largest enclosed field with sheeps of your color. The "village square" tile is played in the middle of the table. "Landscape" tiles are shuffled. Each player gets secretly a "shepherd" tile, and 4 "landscape" tiles. 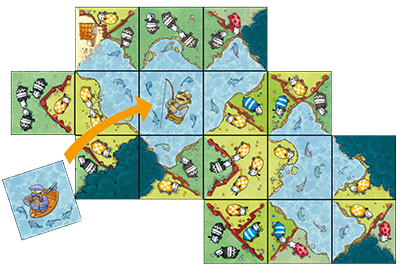 The first player must play one of their four tiles beside the starting tile, taking care to match the landscape of the tiles' edges. For the first turn, it is thus necessary to join a village edge to the starting tile. This player then draws a tile from the bag and adds it to her hand. 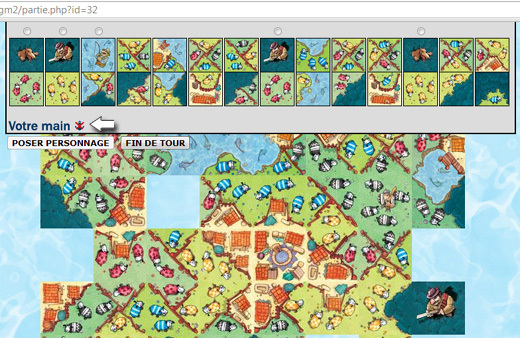 Each player proceeds in the same way: placing a tile next to an already played tile, then drawing a tile (or several). In fact a player draws as many tiles as there are tiles touching the one they played (from 1 to 4 tiles can be drawn). A Hunter token can be played on a Wolf, cancelling the effect of the Wolf. The Hunter can also be played in a forest without a Wolf; it is then forbidden to play a Wolf token in that same forest. Then the player draws as many tiles as there are tiles touching the one they played, as usual. a player can decide to reveal their color, before or after their usual move. The shepherd token (marked with a question mark on the back) is turned over and is played, shepherd side up, on the game board as any other tile, then the player draws from 1 to 4 additional tiles as in a normal turn. He then profits from a free turn and can play another one of their tiles. Each player can choose to quit playing before the end of the game. The first player to quit receives a +6 Quitting Bonus to their score at the end of the game; the second +3, the third +1; and the last player receives no bonus at all (but will be able to finish quietly by playing all the tiles which remain in their hand). When everyone has given up or cannot play anymore, each player determines which enclosed field has the largest number of sheeps in their color, and which does not border a forest sheltering a Wolf. He receives 1 point per sheep in this field, plus any Quitting Bonus. The player with the highest total wins! The tie breaker is the biggest enclosed field. The object of the game is the same as in the original game. In this extension - playable only with the original game - fields bordered by ponds are valid : a pond counts as a fence. Moreover, all enclosed fields which touch a closed pond get a bonus point for each fish in the pond. Ponds should also be protected from Fishermen ! 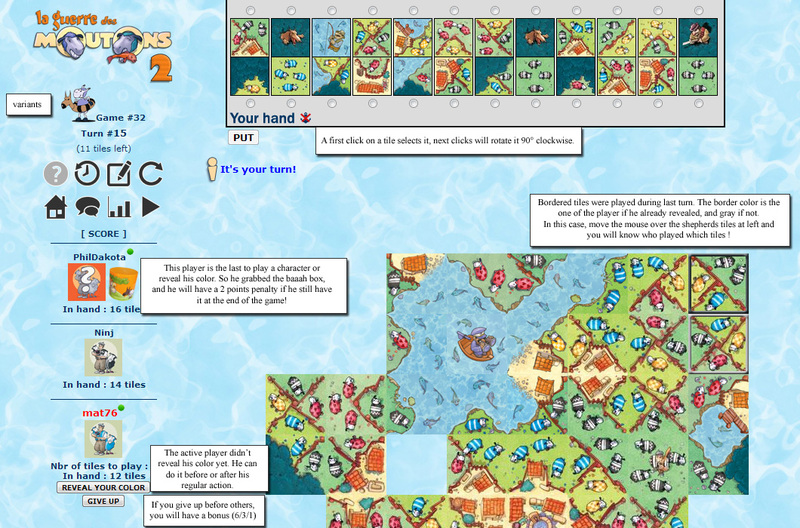 The tiles of this extension are shuffled with the "landscape" tiles of the original game. Then the game starts as usual. Pond consists of several pond pieces adjacent to each other and closed by sheep fences, forests and villages. Fields closed and partially lined with ponds are also taken into account. In addition, all enclosed fields which touch a closed pond by at least one side get a bonus of one point per fish. Warning: if the pond contains a Fisherman, it catches all the fish the pond and no bonus is given, unless a Fishing Guard was placed on top. More tiles means longer games. If you want a game as fast as before but with renewal, check the option "32 tiles discarded " (randomly) when creating a new game. A Fisherman inside a pond threatens all fishes from the pieces that compose it. A pond threatened by a Fisherman worth nothing (but is still a valid border for sheep fields). There are 3 Fishermen in the game. It can be played beside a pond in a preventive manner: no Fisherman can be attached to a pond guarded by a Fishing Guard. If one or more Fishermen are already in a pond, a Fishing Guard is needed to remove each of them (just override the Fisherman with the Fishing Guard). There are 3 Fishing Guards in the game. The player who reveals his color or play a character tile (Hunter, Wolf, Fishing Guard, Fisherman) grabs the baaah box. At the end of the game, the player who has kept the box in front of him gets a penalty of 2 points. Enclosures closed and partially lined with ponds are also taken into account. In addition, all closed fields touching at least one side of a closed pond get a bonus of one point per fish contained in this pond. Warning: If a pond contains a Fisher and is not protected by a Fishing Guard, Fisherman catches all the fishes in the pond and no bonus is given! At the end of the game, the player who has kept the baaaah box in front of him get a penalty of two points. 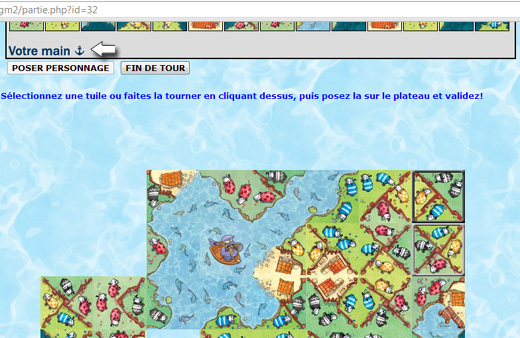 In "anchor" mode, the position of your hand of tiles is linked to the page (if you scroll down, your hand will go up). In the default mode, the position of your hand of tiles is linked to the window (if you scroll down, your hand overrides the board).